I’ve been meaning to write about this old dutch couple that came to volunteer at my parents Aid & Development project. I’ve been meaning to write about it because they seem completely oblivious to 21st century etiquette. 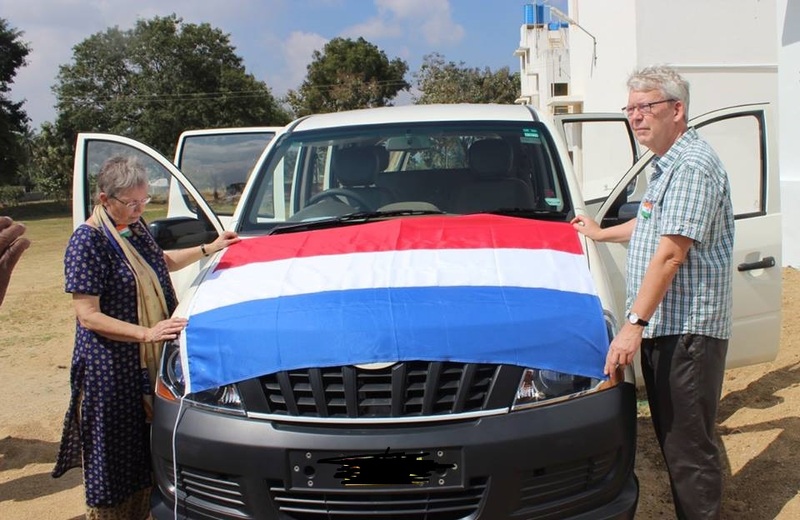 For example, they didn’t think there was anything wrong with them bringing their giant dutch flag and wanting it to be flown at the entrances of the villages where my parents work. To them, they couldn’t see that there was something wrong with white people wanting to plant flags over the land of people from the third world. My dad refused in outrage – it isn’t okay to go around asking people to hoist your nation’s flag. Especially not on their Republic Day. They, of course, thought our outrage was silly and that we were just making a noise to be difficult. So while the new car was being blessed, they went out, brought their flag out and then posed for photos. I am trying to paint a picture of what sort of couple they are. Having read their blog, I know that they think that Indian food is horrible and made to kill your palette, that all Indian cows are dutch cows, that everything in India is inferior and cheap and that every single Indian is uneducated and poor. Because of the language barrier, they went back home thinking that a 5 year tailoring student became brilliant because of her tutelage and an entire farming community became master farmers because of his planting techniques. If it wasn’t for the fact that I saw her put sugar on her egg and eat it whole, my giggling would’ve been replaced by something more vocal. Them – Do you want some cheese? Me – I wouldn’t mind tasting some. Me – Mmm that’s good. What sort of cheese is it? Me – Erm, I know, but what sort of cheese is it? Them – *speaking slowly* it. is. dutch. cheese. Me – No, I mean, cheddar, blue, goat, you know, variety! Them – *losing their mind* IT IS DUUUUUUTCH CHEESE! I think I might be off dutch cheese for good! Next It’s the 5nal countdown! Hahaha. That is really funny that you had a similar experience but with apples. I know Indian food is sometimes an acquired taste but to not even try tasting it, it feels wrong somehow. Maybe cause I was always taught to taste and to try before rejecting something outright! Wow, they sound a bit ‘special’! It makes me wonder what they were doing volunteering there in the first place! I’m sure that they felt that all of India was blessed by the time they spent displaying their radiant Dutchness. Don’t give up on cheese from the Netherlands just because of these two. I highly recommend Gouda with a good wine. Hahaha. Funny you should say that. There is a post on facebook with the lady wearing a blue Indian dress and the husband saying that she was Mother Mary reincarnated, going around blessing Indian land. Oh dear. I’m now hungry for cheese and wine! I think they wanted to film a bit of the projects they “funded”. I put that in quotation marks because they donated a few euros on the occasion of their birthdays or something like that. I suppose you feel superior when you help someone out monetarily. Speak French. 🙂 They can barely utter 5 words. Then they go back north — it’s only 100kms from here. Haha. That’s the plus point, you don’t have to deal with people like that for too long! Etiquette does seem to be a bit of an endangered species these days…. An Italian Indian Pasta would be all the rage these days! En France on dit de ces gens qu’ils sont : Des Beauf-Reac …!!! Ha! This is so funny. I’ve actually been offered an opportunity to work in India and would love your insights and advise. Let me know if you’re able to share some of your wisdom and experiences :). Oooh. Where in India? I would love to be able to help in any way I can! The job is in Goa. However, I’ve only ever lived in big cities in the UK and North America. It’s a really great opportunity, but as evidenced by my desperate plea for help and advise, I’m very nervous about making such a drastic change. Any thoughts? Goa is so laid back. It’ll be like working in Hippie central with a beach at your doorstep. Whatever the job, you’ll have stuff outside of work to feed your soul and it’s always a good adventure for a short period of time! Ahaha, I’m just thinking about that Dutch cheese again. Baha! Since they already know everything and everything’s better at home, you have to wonder why they left.